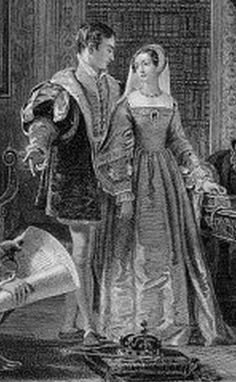 On this day in 1553 – Lady Jane Grey and Guilford Dudley were married. On 25th May 1553 Lady Jane Grey was married to Guilford Dudley. Jane would have been around 16 years old at the time of her wedding and although there is no exact birth year for Guilford it is believed he was around the same age. The wedding was attended by almost all English nobility with the exception of the King, who was ill and unlikely to live. The marriage was partly of convenience with the King dangerously ill; John Dudley feared that his position would be in danger if either Mary or Elizabeth took the throne so he moved to secure his position. The Dudley’s and Grey’s moved to arrange the marriages of their children. With Jane having a strong claim to the throne the Dudley’s arranged to marry her to their only unwed child, Guilford. At the same time a two offer weddings took place between Katherine Dudley and Lord Henry Herbert and Lady Katherine Grey and Lord Henry Hastings. Each couple were dressed in silver and gold during the ceremony, as the weddings were rushed the outfits were borrowed from the Master of the Wardrobe. With the death of King Edward VI, Jane was proclaimed Queen in place of Mary and was taken to the Tower of London to prepare for her coronation alongside her husband. Jane was unwilling to take the crown and was noted as saying; ‘The crown is not my right, and pleaseth me not. The Lady Mary is the rightful heir’. Jane, Guilford and her family were all arrested upon Mary’s arrival in the city and imprisoned in the Tower of London where they awaited trial and eventually the executioner’s block. Jane would be known as the nine day Queen.